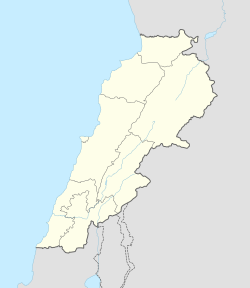 Shmustar, also spelled Shmistar or Chmistar (Arabic: شمسطار‎) is a Lebanese town located in Baalbek-Hermel Governorate, Lebanon between Baalbeck and Zahleh, on the eastern slope of Mount Sannine. It overlooks the Bekaa Valley from an altitude of 1,250 metres (4,100 ft) above sea level. The town is 75 km (47 mi) from Beirut and 21 km (13 mi) from Baalbek. This page was last edited on 30 July 2017, at 02:28 (UTC).